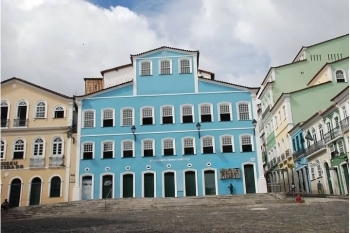 The Historic Centre of Salvador de Bahia, frequently called the Pelourinho, is extremely rich in historical monuments dating from the 17th through the 19th centuries. Bahia was the first colonial capital of Brazil and the city is one of the oldest in the New World (founded in 1549 by Portuguese settlers). It was also the first slave market on the continent, with slaves arriving to work on the sugar plantations. In February 1993 I arrived at Salvador airport intending, on the grounds of personal safety, to stay in the suburb of Barra. Two Spanish women I met persuaded me that this was for milksops and that I should do as they were about to do and stay at the Hotel Pelourinho overlooking what the South American Handbook of the day called "...the finest complex of colonial architecture in Latin America". Their advice was good and I found myself at the heart of what I consider, still, to be one of the most exciting cities anywhere. The architecture in the historic core of Salvador is exceptional but better described by others elsewhere, but for me it is the people who make the place unique. It is said to be the most African of Brazil's cities, and at times I felt that I could have been in Senegal. There is a group of statuesque ladies clad in spotless white, lace-trimmed, full length African costumes who make a living by preparing and selling a local fast food, a kind of rissole of coarse semolina deep fried, split and topped with vegetables and spices. One evening I went to one of the many candomble temples. They are so numerous here that they cannot be simply a tourist trap. I was far from being the only European there but we were greatly outnumbered by worshippers. I stayed for several hours and found the whole experience fascinating, though I confess that I left not a great deal wiser as to the precise significance of what I had seen. In Largo Pelourinho, the square next to the hotel, the Olodum drummers (as featured by Paul Simon in Rhythm of the Saints) practiced regularly and down the hill near the waterfront were bewilderingly fast exponents of Capoeira. In the crowds milling around in the square I was subject to more than one attempt at pick pocketing but, to my surprise, a slapped wrist and a knowing smile or wink was enough to send the would be thief on his way. Slavery: Malé Revolt - "most significant slave rebellion in Brazil" 1835. Charles Darwin: 1832 February 28; The ship arrived at Salvador, Brazil, in All Saints Bay. Darwin explored the tropical rain forests on long walks by himself, taking in the rich glorious spender of nature. In town Darwin was disgusted at the sight of black slavery.